The semi-final cast of the UFL Cup is complete; and football fans in this country are in for a treat next week as the four remaining clubs take another step along the rocky road to the final. 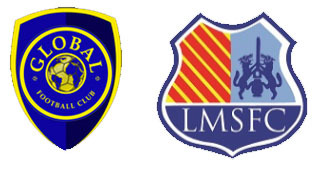 Global FC take on the Loyola Meralco Sparks in what ought to be the glamour tie, two clubs which boast some of the biggest names in the UFL. The other tie is between Green Archers United and Stallion Penson FC, two clubs eager and willing to rewrite the pecking order among UFL clubs. Because the two clubs clash in one of the semi-final ties, an intriguing David-and-Goliath final is assured. Global was the first to book its place in the semis after a masterful extra-time 2-1 conquest of league runners-up Kaya FC last Tuesday. The match will probably be long remembered as the Misagh Bahadoran show after two glorious runs by the Filipino-Iranian tore Kaya apart and sent Global through to the semi-finals. The Stallions could not dispose of General Trias FC after 120 minutes of football despite having carved out enough chances to win comfortably. The game itself was at times godawful ugly; but it was nonetheless engrossing because of both teams’ full-blooded commitment. Last night, the Sparks were in cruise mode on their way to a 5-nil demolition of the Philippine Army in a quarter-final clash at the University of Makati football stadium. Army were feisty as could only be expected of the Armed Forces club and saw as much of the ball as the Sparks did. However, they were undone by their own comical defending as much as the Sparks’ brilliance; and there was never any doubt about who was moving on to the semi-finals. On the basis of current form, the odds ought to be slightly in Global FC’s favour. The Sparks, when on song, probably play the UFL’s loveliest football. What they seem to lack is steel – something that Global have plenty of – and the appetite for the big game. Global, on the other hand, are the UFL’s most resilient team. They can play flowing football as much as the Sparks but are not averse to sitting back absorbing attacks and simply whacking it when necessary. Crucially, Global’s defence has been the UFL Cup’s most frugal. Stallion Penson and Green Archers both needed penalty shootouts last night to book their semi-final places. It took six rounds of penalty kicks to finally settle the match 5-4 in Stallions’ favour after the match ended goalless after extra time. Just as well; a club made up entirely of expatriate Korean college students in a cup final would not have been flattering for Philippine football. In last night’s third quarter-final played at the Nomads field in Parañaque, Green Archers and Pachanga-Diliman FC scored a goal each in the first half but could not be separated all the way through extra time. The Archers won 4-3 on spot kicks. There is little to choose from between the Stallions and the Archers in next week’s other semi-final. Both teams love to break quickly from the back; and the question to ponder is which team will take the initiative and go on the front foot. Both teams conceded just three goals in the group stages. The Stallions scored four goals more; but that was due to their 5-1 rout of the Air Force when the Airmen looked so off-colour.